Researchers may have uncovered a way to observe dark matter thanks to a discovery involving X-ray emissions. Anyone with a passing knowledge of space and astrononmy has heard of dark matter, a material believed to account for most of the known universe. We say "believed" because technically it hasn't been observed; the only reason we know it exists is because of gravitational effects on nearby objects, but otherwise it's completely invisible to light. But a major discovery this week suggests that invisibility doesn't extend to X-Ray emissions, which scientists may finally have used to detect dark matter in the universe. It all happened when astronomers were reviewing data collected by the European Space Agency's XMM-Newton spacecraft and noticed a spike in X-Ray emissions. 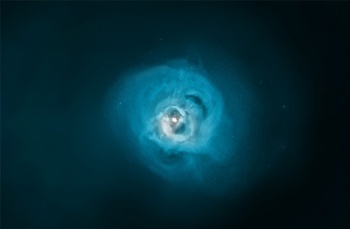 The anomaly came from two celestial objects - the Andromeda galaxy and Perseus galaxy cluster specifically - but didn't correspond to any known particle or atom. What the researchers did notice, however, was that it lined up perfectly with the theoretical behaviors of dark matter, allowing us to finally "see" it for the first time. "With the goal of verifying our findings," said Alexey Boyarsky of Switzerland's Ã‰cole Polytechnique FÃ©dÃ©rale de Lausanne, "we then looked at data from our own galaxy, the Milky Way, and made the same observations." If the EPFL's findings hold up, this has huge implications for future astronomy research. Our current picture of space accounts for dark matter tangentially since we can't actually see it. But Boyarksy thinks it might be possible to develop technology to observe it directly, which could vastly change our perceptions of outer space. "Confirmation of this discovery may lead to construction of new telescopes specially designed for studying the signals from dark matter particles," Boyarsky explain. "We will know where to look in order to trace dark structures in space and will be able to reconstruct how the universe has formed." That also sounds handy if we ever get warp technology off the ground and need to chart a path around dark matter, but I'm probably getting ahead of myself on that score.